Twitter has extended the reach of Vine, its six-second video service, after the app was made available for Amazon’s Kindle Fire tablets. Vine shipped to the Amazon store today (here). That’s made more significant because close rival Instagram (which added video support one week ago) does not currently offer a dedicated Kindle Fire app. Amazon doesn’t provide regular figures to illustrate sales or shipments of Kindles, but reports suggest that they are the most popular Android-based tablets worldwide so support is likely to help Vine/Twitter’s battle with Instagram/Facebook. Back in January of this year, Localytics estimated that the US-based Kindles alone represented one-third of Android tablets worldwide. The data was captured before the Kindle Fire became available worldwide, so it may well that the figure is higher today. Either way, since the Kindle runs a ‘forked’ version of Android, developers and company must alter their apps in order to reach Amazon tablet owners. Vine landed on Android four weeks ago, so it’s expansion to the Kindle Fire has been fairly quick. With the Amazon tablet covered, the chances of the app coming to Windows Phone — and perhaps even BlackBerry 10 — are raised, particularly since Instagram currently supports neither platform with a native app. The Kindle Fire launch comes during challenging times for Vine and Twitter. Analytics from Topsy — spotted by Marketing Land — showed that Instagram remains more popular than Vine based on the number of links that were shared to Twitter last week. Twitter and Vine appear to have plans to increase the competition with their Facebook-owned rival. This week Vine for Android got front-facing camera support — to allow ‘selfies’ — and the app’s founders recently teased details of a major update coming soon. The team has also resorted to a more traditional method — the email blast — after it reached out to registered users of Twitter that have not downloaded Vine with an email to promote the video app. 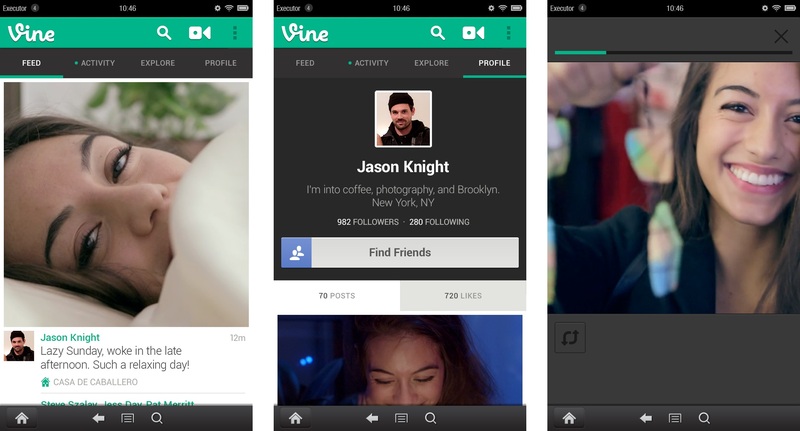 Kindle Fire users can grab the dedicated Vine app from the link below — happy videoing.